Cars and trucks wait in line to pass over a bridge that was hit by an airstrike in 2016. This road is one of four roads linking Hodeida (Al Hudayda) with the rest of the country. 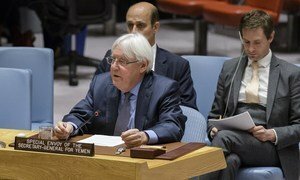 The United Nations Special Envoy for Yemen announced on Thursday that after two years of stalled talks on resolving the crisis in the country, he plans to invite the warring parties to Geneva on 6 September for a round of peace consultations. “It is time long past for us, together, to call for an early resumption of the political process, two years since the last round in Kuwait,” said Martin Griffiths, referring to the UN-supported peace talks that where first held three years ago in Switzerland before shifting to Kuwait in April 2016. Since the uprisings that broke out in Yemen in early 2011, the UN has been engaged in helping Yemenis to find a peaceful solution. However, on 26 March 2015, a coalition of countries led by Saudi Arabia intervened militarily at the request of President Abd Rabbuh Mansour Hadi to secure the return of the Government to Sana’a, which had been seized by Houthi militias and allied units of the armed forces. Three years on, the fighting is still raging, and the ensuing humanitarian crisis has only deepened in a country that was already one of the region’s poorest. In the Council today, Mr. Griffiths said it is time to “begin the difficult and uncertain journey away from war” and that there is now a chance “to weigh the opportunities for peace” in the war-ravaged country. Martin Griffiths, UN Special Envoy for Yemen, delivers his remarks during the Security Council meeting on the situation in the Middle East. Describing the ongoing the battle for Hudaydah, a port city on the Red Sea, as “the centre of gravity of the war”, he stressed that the gap between the two sides is being narrowed “in a way that nobody expected”. This issue, he said, “has a better chance of being resolved within the context of a comprehensive political settlement”. He called on Council members to “urge the parties to resolve this conflict through negotiation rather than through military means”, explaining that he will invite the warring parties to Geneva on 6 September for a round of talks. “These consultations will provide the opportunity for the parties, among other things, to discuss the framework for negotiations, relevant confidence-building measures and specific plans for moving the process forward,” said Mr. Griffiths, requesting the Council’s support. “We know what can work. We have talked to all the sides. We have studied the experience of past efforts to resolve this conflict. One hundred days in Kuwait is a valuable guide for us,” he insisted. The Director of Operations for the UN Office for the Coordination of Humanitarian Affairs (OCHA), John Ging, also briefed the Council, painting a bleak picture of the situation on the ground. John Ging, Director of the Coordination and Response Division of the United Nations Office for the Coordination of Humanitarian Affairs, addresses the Security Council meeting on the situation in Yemen, 2 August 2018. “You have heard the statistics many times: more than 22 million people — 75 per cent of the population — require humanitarian assistance and protection. Three years of conflict have left 2 million people displaced from their homes; 8.4 million people do not know where their next meal is coming from; and, the worst cholera outbreak in the world occurred in Yemen last year, with 1.1 million cases,” said Mr. Ging. “The humanitarian situation is indeed shocking, both in scale and severity,” he stated. “The toll of this conflict on civilians and civilian infrastructure is devastating. Incidents in which civilians are killed or injured continue to be reported with alarming regularity”, he said, calling all parties to “respect international humanitarian law, including the obligation to protect civilians and civilian infrastructure, and to take all feasible precautions to avoid and minimize incidental harm”. Mr. Ging also paid tribute to the humanitarian organizations in Hudaydah who “stayed and delivered”, per their mandates. “About 90 per cent of people displaced by recent violence have, in fact, received emergency relief packages. These packages contain food, hygiene supplies and other supplies to reserve dignity,” OCHA’s Head of Operations explained. The crucial Yemeni port city of Hudaydah, which has been living under fire from pro-Government forces for weeks now, could be just “one airstrike away from an unstoppable epidemic”, said the United Nations Humanitarian Coordinator in the country on Sunday. 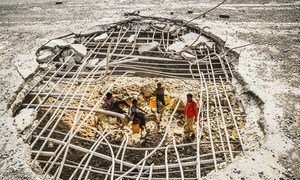 Warring parties in Yemen have expressed their “strong desire” to achieve peace, the United Nations Envoy for the country has reported.